One of my long-time fashion philosophies is that I buy what I love. 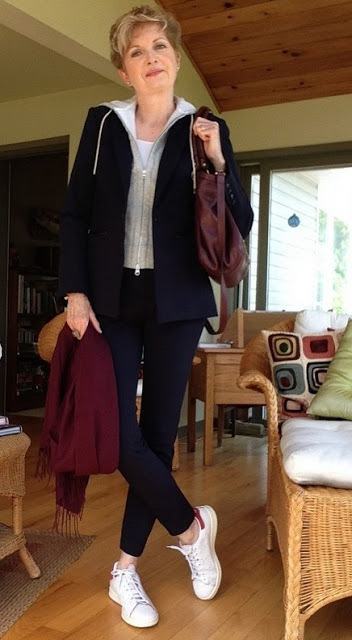 I don’t mind spending extra for something perfect, something that makes me sigh when I put it on, as I said about this burgundy sweater in a post recently. But spending more on a special item means that I don’t buy many pieces, and when I do find something I love, I love it for a very long time. And that philosophy, my friends, requires that I take good care of my clothes. I think of it as protecting my investment. I don’t want to waste my money on pieces that I don’t love, or that I won’t wear. And I also don’t want to waste my money, or my time searching for just the right thing, by not properly caring for my clothes. I learned early the importance of taking care of my good clothes. Growing up we always had school clothes, and play clothes. And we never played in our school clothes, or went to school in our play clothes. After school finished this idea continued; I always took off my good clothes when I came home from work. I still do now that I’m retired, even though the outfit might be a good pair of jeans and a sweater, instead of a suit or dress. I take off my nice things and hang them in my closet or fold them into drawers. Then I change into sweat pants or shorts and a tee shirt before I do anything else. I never sit around with my book, or cook dinner in my “good” clothes. Good thing, too. Most of my sweat shirts and casual tees have stains on them from cooking. Aprons don’t cover everything and, as Hubby always says, I’m a very messy cook. I thought that this was standard practice for everyone until a conversation around the lunch table at work one day a few years ago. Several of my younger colleagues were astonished that I did not wash everything I wore each time I wore it. And I was equally astonished that many of these girls had no clue how to make their clothing budget go further by properly caring for their clothes. I mean it’s not rocket science, is it? Good sweaters and blouses should be hand washed in cold water and laid flat or hung on the line to dry, or dry cleaned depending on the fabric. And they don’t need to be washed every single time they are worn. Jackets and suits should be dry cleaned. Usually once a season. Jeans with spandex should be line dried, not thrown in the dryer. These are things I’ve always known, and done. You’ll not catch me throwing my new Akris sweater or my beloved Tory Burch blouse in the washer. Another thing I’ve done, which I highly recommend, is to find a good, independent dry cleaner. One you can trust. Like my buddy Hassan at Quality Cleaners in Manotick. Years ago he gave me a great brochure explaining all the clothing care symbols. This was before the internet, folks, when I was often stumped by the meaning of those tiny pictures on clothing tags, especially if they were not accompanied by an explanation. Over the years Hassan has sent items back home with me, uncleaned, explaining that they’d do better if I washed them by hand, or he’s held onto a dress while I raced home to get the matching belt so that if the dress faded slightly the belt would be the same colour. He is a true gem. I honestly think he cares as much about my clothes as I do. After a recent question from a reader about how I care for my clothes, I thought I’d do some research. I know that things have changed over the years. Washing machines have come a long way; I now trust some of my good pieces to the delicate cycle instead of hand washing. Maybe there’d be all kinds of stuff to learn about keeping my good clothes, well, good. In fact, there are some wonderfully helpful websites about how to care for clothes. This article on the site Wonder How To explains that while clothing manufacturers are required to provide clear care instructions, if an item can be cleaned more than one way, they are only required to list one method. Huh. I never knew that, did you? So maybe some of those “dry clean only” items can be hand-washed, after all? I guess that’s what Hassan was telling me when he sent me home with that cashmere sweater a few years ago. The article goes on to explain how to decipher care symbols, and which fabrics can be hand washed, and which should be professionally cleaned. I learned that coloured cotton, and white nylon, should always be washed in cold water. Really? Who knew all this stuff? And here I was being pompous with my young colleague who washed a cashmere sweater in the washing machine. Okay, maybe that was pretty silly, especially when it clearly said on the label not to do that. But it turns out that I was not the expert I thought I was. Since my new burgundy turtleneck has camel hair in it, I found this article on the website The Laundress interesting. Although the site is mostly about selling their specialized cleaning products they have a whole section of “how to,” that has tons of information. I also found a great section on how to care for suits on the website Black Lapel. It’s predominantly a shopping site, too, but I learned lots. For instance, did you know that steaming is not just for releasing wrinkles? It also can help freshen up jackets and dress pants. I’ve always felt that an end of season wash or dry clean just made things easier when I pulled jackets and blouses out of storage the next year. But I read that storing items clean can help prevent insect damage. Huh. And I learned the value of brushing wool jackets after wearing, and before putting them back in the closet. It seems that hair, lint, and dust can be damaging to any organic fabric. Seriously, who knew? I guess I should have paid more attention to Bates, his lordship’s valet, during all those jacket brushing scenes on Downton Abbey. Now, I wonder where one can purchase a good clothing brush. And if I’ll have to re-watch all six seasons of Downton to learn how to use it properly. Of course there are lots of other issues when it comes to caring for good clothes. Best ways to hand wash, proper storage for woolens and knits, etc etc. And as for the problem of pilling, which one reader mentioned a while ago, I don’t have any answers. Since I don’t carry piles of books, and file folders full of papers around in my arms all day at work anymore, I don’t have a problem with sweaters pilling. And now that I’ve read this article on the website The Spruce, I know why. Have a look if you’re interested. So that’s my two cents worth about caring for my good clothes. With a few cents added in from other sources, of course. And speaking of cents… and sense. It just makes sense to me, that if I’m going to pay good money for my clothes, I should protect my investment by taking good care of my good clothes. It’s a good thing, as Martha Stewart might say. Okay. So that’s not really Hemingway. I know you weren’t fooled. And now, dear readers, it’s your turn. Any good advice for us about how you care for your good clothes? 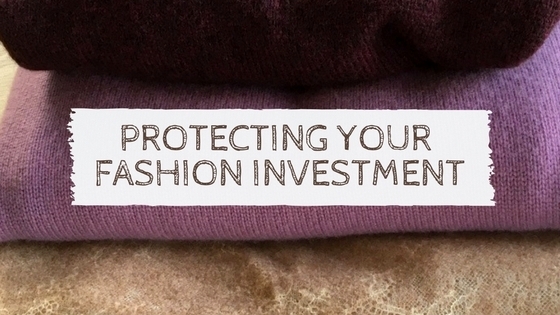 Or how you protect your fashion investment? Wow. I am, it appears, something of a slattern. Except I only wear shirts once and mostly jumpers too. Some years ago I started taking risks with things that were Dry Clean Only and seemed perfectly fine in the washing machine on a quick, cold wash, with no problems. I do take coats to the dry cleaners regularly however. My husband has the idea that I am not to be relied upon not to shrink things but this is based upon two small mishaps, both of which occurred many years ago. After years of watching people insist on hand-washing things that really don't need it, modern washers being what they are, I think it is mostly a case of old wives tales and what your mother did. But then I like doing laundry. Not rocket science indeed. What drives me mad is when people don't iron. Sacrilege…enjoy the hols. How kind. Perhaps I will pass this time. It's funny how we all draw the line at different places, isn't it? I still haven't had the courage to hand wash silk blouses. Maybe I'll practice on an old one, so if I ruin it I've already had lots of wear out of it. So good to hear your clothes care tips. And I loved that The Sun Also Rises, classroom required reading in my day, also has practical applications. Who knew that Hemingway was so into clothes care … ?! Ha. Thanks, Mary. I think Hemingway was a closet sweater lover… remember that picture of him in his fisherman knit? A good post , I'll go read all the tips now . Like you , best clothes are off & casual stuff is on as soon as I get home . Drilled into us by mum . Even now I don't want my favourite clothes getting misshapen , messy or covered in dog hairs ( I'm not really a slob – well maybe in the garden ! ) . I always let clothes 'air' before putting them away & , if creased , I mist with a plant spray whilst still warm & then air them . A lot of creases seem to drop out that way . I also pad the sleeves of coats & jackets with bubble wrap to keep their shape & scatter moth deterrents around . I don't find many things in the shops that I really love , so I do like to look after them . Wendy in Scotland just now . I must try that misting and hanging trick. Thanks, Wendy. Great post! I have found that airing out my clothes on my covered (and very private) back porch is a good way to keep them fresh between wearings. Also, several years ago I purchased The Laundress Clothing and Upholstery Brush on Amazon. It's a bit pricey but the quality is excellent and it really works! I don't have a lot of clothes but I do love what I have and I honestly enjoy taking care of them. Funny you should say that about enjoying taking care of your good clothes. I feel the same way. I love my clothes (especially the investment clothes :-)) and taking care of it is a kind of pleasure,even hand washing and ironing. I hand wash (and very rarely wash things-only white silk blouses!-after one wear) wool and cashmere sweaters and silk or cashmere scarves (even Hermes-but it is only my decision,don't follow me :-)),in cold or very mild water,I never let them soak(it is very important,the colours could mix and patterns could blur),I use Ecover mild detergent. The trick with the towel is important,too,I don't squezze aggressively. I wash my cream silk blouses and sleeping gowns in wash mashine on silk cycle (my washing mashine is Miele) ,when I don't have time,and take them out immediately to air dry. Almost all of my friends don't do hand washing,but I like it and my things last forever. I've been wondering what to do about some of my good scarves. And once we have a non-humid day, I'm going to hang some of my summer things out to in the fresh air before I pack them away. I try to use lavender too, but having trouble finding it here. I love your camping holidays! I too grew up changing from school clothes to play clothes, and still have home clothes vs going out clothes. There are also "get really dirty" clothes for working/exercising outside when its super hot or when getting really dirty is on the agenda – going to pick up a load of mulch for example – and play clothes and getting dirty clothes are washed a lot and wear out faster. Going out clothes (if not spilled on, a sadly frequent occurrence) get aired and put away until hey "need" cleaning or the end of their season, then its the delicate machine cycle or hand wash/air dry. I'll enjoy reading your links for new approaches, however. I also have clothes that I wear for working out and getting dirty, and even worse ones for canoe camping. I'm particularly fond of an old sweatshirt that I wear camping that is falling apart from repeated washing. But I still love it. Does anyone remember the mesh sweater dryers you used to own? They were a lifesaver for me: hand washing sweaters and drying them raised up off the ground on one of these mesh dryers. Well, that was a long time ago! I don't think they make them anymore? So many "young 'uns" just send everything to the dry cleaner. No no no! And those same young uns do definitely think clothes should be washed after each wear. Really? Are you that dirty? I agree here that most things do not need cleaning/washing that often! And, of course, we do not own a clothes dryer, so line dry it is! I just bought one at Walmart. It says Mainstays Stackable Sweater Dryer on the box. Stackable in that if you buy more than one, you can stack them. I used an old one of my Mom's for years until it literally fell apart, so I was glad to find a replacement. Thanks, ladies. I must look for one of those. Love that, Rosie. Indoor and outdoor clothes. 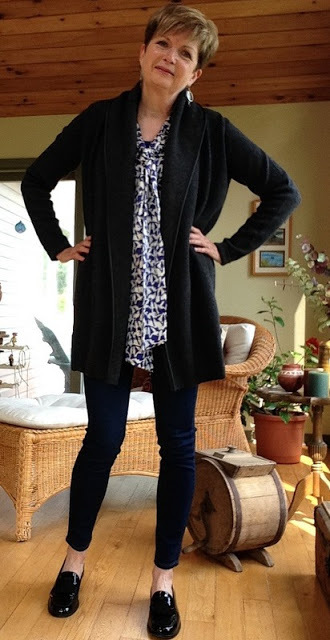 Great post – and I'm going to take some of the credit since I was one of your readers who requested a post on caring for clothes 🙂 Years ago, I dated a man who sold appliances at Eatons (it was a LONG time ago!) – he told me dryers are ruinous to clothes and cautioned me to air dry everything except socks and underwear. I took this advice to heart and have long since hung my shirts, pants, knits (except knits that are almost entirely synthetic), and bras. Once dry, I may give them a quick "fluffing" in the dryer, but it's quick! The relationship didn't last, nor did Eatons (sadly), but his advice lives on. Now, one more request: a post on caring for shoes, boots, and handbags. Thanks! Yes you were! Thanks for that suggestion. Ah Eatons… I miss Eatons. I don't do much about caring for boots and shoes.. but I'm happy to be a conduit for the wisdom of others. Later in the fall I'll take a stab at that. I've learned that lesson the hard way, Susan. I've ruined good quality wool sweaters by either not storing them properly ( moth and silverfish massacre ! ) or getting food and grease stains on them while cooking. I wish someone would make an apron with sleeves! I splatter and spill a lot when I'm cooking. Or tossing salads…or leaning into the counter… etc etc. P.S. I always wondered what a skivvy was. I'm paraphrasing here… Most dictionaries define it as " Australian ( noun ) A snug/tight fitting lightweight garment for the upper body usually with a high round fold over collar. " You're right, Janie. If a tag says Dry Clean, it may well be washable because they only have to specify one way to clean the product. But I was pleased to find that article which said what to do with which fabric. I also change into knocking around the house clothes as soon as I get home. I can't get down to stuff unless I do. Me either. Even sitting. Like Wendy, I don't want things to lose their shape too soon. Are you familiar with Kleinerts? I am a big fan of their LACE VALARA garment shield which is worn over a bra and provides perspiration protection for your clothing. They also offer disposal underarm shields with adhesive backing that works better on some fabrics than others. These products really extend the life of sweaters, jackets and dresses as less washing or dry cleaning is required. I'm not familiar with Kleinerts. Those shields would be good for summer dresses, wouldn't they?